A charming sequel to the classic picture book, Rosie’s Walk. Rosie has lost her little baby chick. She looks everywhere - under the hen house, in the basket, behind the wheelbarrow and even through the straw. But Rosie just can’t find her baby chick! And what Rosie doesn’t know is that someone is following her every move… be careful Rosie! 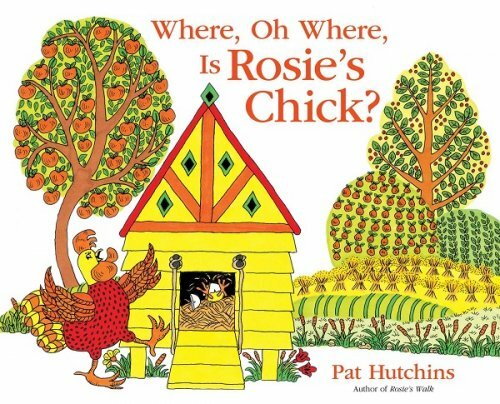 The illustrations in ‘Where, Oh Where, is Rosie's Chick?’ are equally as bright and engaging as in ‘Rosie’s Walk’, with lots of humorous details of the two predators getting foiled as they try to catch Rosie and her chick. Children can’t help but join in the story as they try to convince Rosie to turn around to find her little baby or laugh out loud at the predators’ misfortune. The short, simple and repetitive language makes it an ideal choice for supporting language development in young children. The repetitive text is fantastic for targeting grammatical goals, such as regular past tense verbs. This story is also perfect for modelling more complex sentences to children through the use of conjunctions (e.g. Rosie looked under the house, but the baby chick wasn’t there). I especially love using this picture book to target the concept of ‘where’ and prepositions (e.g. in, on, under, behind, through). For further speech and language targets in ‘Where, Oh Where, is Rosie's Chick?’, see the list below.